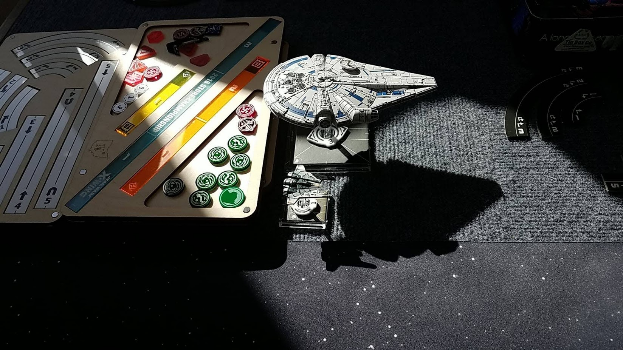 It has been three months and three tournaments since the release of X-Wing 2nd Edition. It is a perfect time to recap and share how things have been shaping up along with showcase some of lists being flown in our area. The McPherson store’s release tournament was just a couple of days after the street date in September. It was extended format and all 12 players showed up to play with their new toys. I had originally planned to fly Luke, Norra (Y-Wing), and Thane, but at the last minute I talked myself into using the new Lando’s Falcon. It is such a beautiful model, I had to get it on the board. I went with Supernatural Luke & Rebel Lando (using the Scum model). Luke is probably the best ship/pilot in the game. The flexibility to boost or barrel roll before you do anything is hard to beat. It is just his cost that makes him hard to pair with. Both ships being at Initiative 5 / i5 (hard not to say Pilot Skill), it allowed my favorite trick – pilot order flexibility! Ben brought a cool list of 3 TIE Advance X1s with Fire Control System and the revamped Lambda Shuttle with the new pilot Colonel Jendon. So round one, all his X1x could take a target lock, setting them up so they would have full modifications during the initial engagement. It didn’t end pretty as I lost Luke being way too aggressive and Lando just couldn’t take on Ben’s entire squad himself. The constant rain of crits into a large base with lots of hull is just horrible to experience. John decided also to bring the new & improved Lamda shuttle plus a beefy Defender, and a TIE (striker?). I found Luke liked more cautious approach better. And like all my games, I left Lando’s turrets to the sides and plinked from the edge. The rocks where my friend despite the new Collision Detector on the shuttle that allowed it to fly thru rocks. The Defender are stronger, but struggle just the same in rocks. All i5s– Whisper, Duchess, and Rexler Brath. I got lucky with roll for the Initiative, so both my ships moved after his which was a big advantage with Luke. At one critical point, Luke used the true power of the Force by threading the needle between all 3 of Imperials to avoid a trap Richard had expertly set. Unfortunately time got the better of us and I just managed to squeeze out a win on points. Hopefully next time we get to finish it. Lastly I faced what I think is the best Rebels’ architype right now– a 4 ship list. 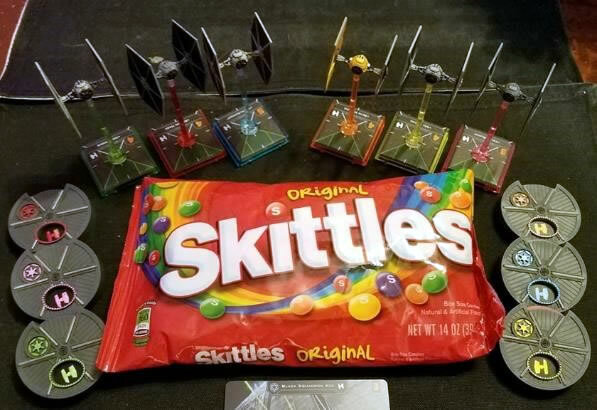 In this case, Bryan brought 2 B-Wings and 2 X-Wings all at Initiative 3 (i5). I over estimated how much HP I had to chew threw and my i5s couldn’t kill a ship fast enough to cut down the incoming shots. I believe I could have won this except for an untimely crit that turned the game (often the case with the new damage deck). Panicked Pilot’s double stress ended Lando’s actions for 2 rounds which killed him. I also forgot about the new ½ rules for all ships & lost with a ½ pts Luke vs a single full Red Squadron Veteran. I felt 2-2 was pretty good for a new version of the game and an untested list. I learned lots of information which I would carry forward. But I really enjoyed the way the force worked on Luke, flipping the S-Foils open & closed, and testing out the new barrel roll. 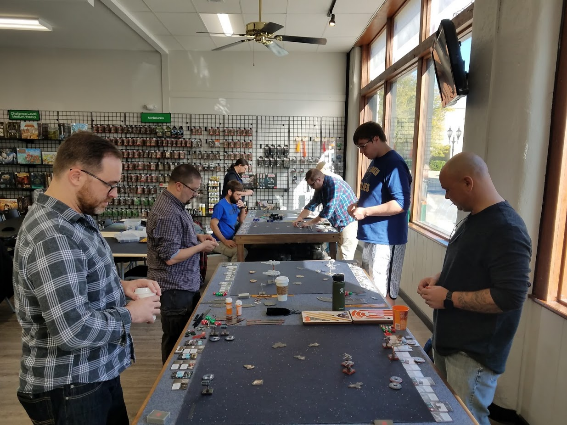 Next up was the opening tournament for the Manhattan store in October with the new 2nd Edition format that limits list building to just the current Wave I ships, pilots & upgrades. This meant the Rebel Falcon was out but that was OK as I was dying to try the revamped Firespray. In 1st edition, I tried to make this ship work, in particular Boba Fett. But his cost and ability was always one step behind. In 2nd edition, it moved to the smaller medium base, improved its dial (white hard 1 is amazing), and added a native white boost. For this tournament, I settled on Boba & two Fang Fighters at full 200 pts including my new favorite bomb – seismics! We had 9 players so someone had to sit out. While I was bummed, I ran around taking some pictures and chatted with others since it isn’t something I always get to do a lot enough of. Right out of the gate I faced a fellow 1st Edition veteran, Mike from Lawrence whom I’ve enjoyed playing against in other area tournaments. He bought a list I had looked at: Luke, Norra (Y-Wing), Supernatural Luke, and Wedge – with Proton Torps. To my chagrin, I found Boba really doesn’t like Wedge with torpedoes. I lost Boba but in the end the 2 Fangs finished Norra for a win. Next up was another fellow Manhattan 1st Edition veteran & store champion. Jason brought Scum Han (with docked Lando in the Escape Pod) and Fearless Fenn. Two i6 aces meant Boba was playing from behind, allowing Jason to see where I moved plus could kill my ships before I even shot. I lost a Fang in round one of engagement but followed up with trading Fenn for a Seismic Bomb. Boba managed eventually finish it for a win. Last game was against one of our new and rising players in Manhattan, Ryan. He brought another version of the Rebels’ best archetype (4 ships). His list included Dutch with Proton Bombs and 3 X-Wings with R3 astromech. Ultimately I eked out a 3 pt. win in a nail bitter as this time the ½ pts worked in my favor. Overall, I LOVED playing flying the Firespray, it is a dream to fly now. It has more slots and title combos than any other ship in the game, making it extremely very versatile. I look forward to flying more of this more in the Extended format. 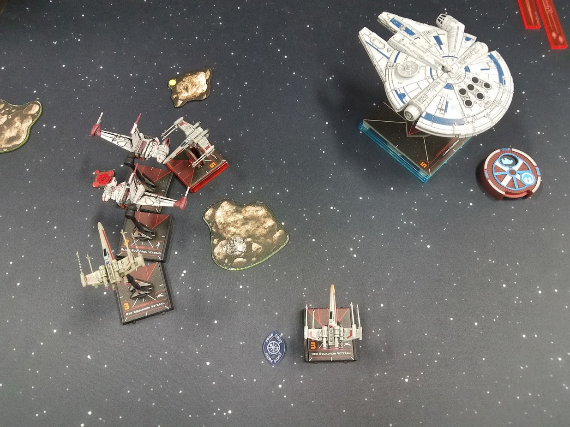 The November tournament was back to the McPherson store for the Battle of Yavin, a limited format with just ships & pilots that appeared in A New Hope (so no Scum). It was the excuse to try something completely new & different – a TIE Swarm! I have avoided swarms because # of ships and how hard I heard it was. I figured I’d give it a shot with a 6 TIE Swarm using the new Inferno Squadron pilots since this format had no Trajectory Simulator or Boba Fett to worry about. Plus this allowed me to use all 6 of my colored dials & bases for a rainbow of flavors! 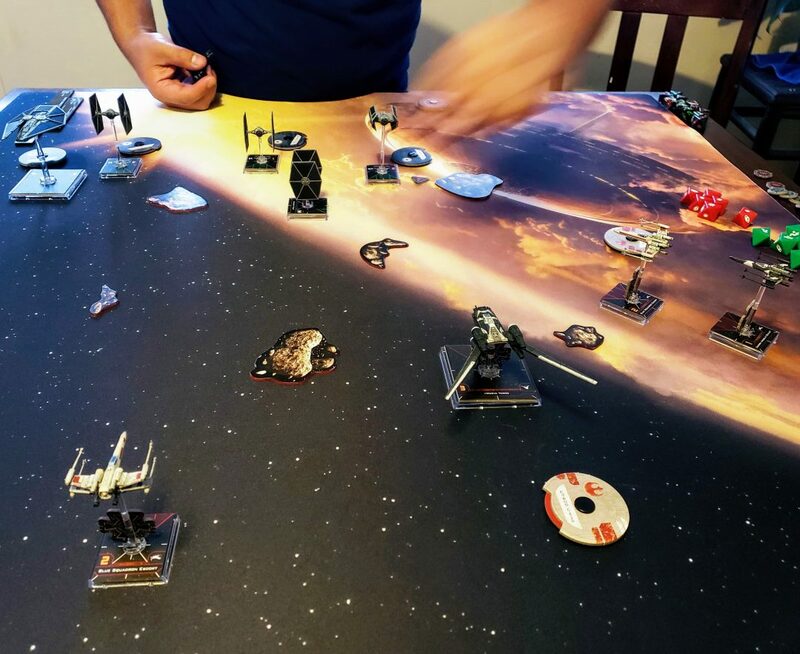 Out of the gate – another TIE Swarm type list flown by Virgil, the 2018 Manhattan Store Champion! The major differences were his list had 4 TIEs plus a Lamda Shuttle & my Inferno pilots had higher Initiatives. We jousted & it was a bump fest. I killed everything but the Shuttle before time was called. 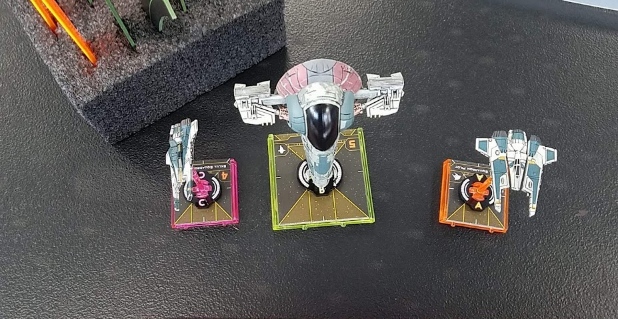 Russ, whom I’ve faced many times including in a store championship finals in 2017, brought three Rebel in Luke, Dutch, and Wedge – all with Proton Torpedoes. Wedge sank a fully modified torpedo into Howlrunner & should have killed her – but Iden soaked it up & said “nope”. When time was called, I lost one TIE with only Dutch left for the Rebels. Ryan brought another version of 4 ship Rebels using Gavin & four Y-Wings – with Proton Bombs! This was a scary match up as TIE Swarm at some point needs to K-Turn behind the opposition. After baiting out a set of bombs and K-Turning off angle, I won – losing just one TIE and killing all but one of the Y-Wings. I feel the TIE Swarm is pretty strong in 2nd Edition. It does remain one of the hardest, yet most rewarding list I’ve flown. It relies patience, dials, planning ahead, & execution – even rock placement is key. The Inferno pilots have some of the best synergy in the game & I hope we see more of that across all factions. After these first trilogy of tournaments, I flew three different types of lists, including one I would have never tried in 1st Edition. Just as exciting, I faced a wide variety of lists & players. I certainly feel 2nd Edition has opened up a wider range of list building and formats along with cleaner game play. I look forward to more experimenting and trying other ships & pilots as we head into December when First Order and Resistance will join the battle! I just got done playing my last game of X-Wing 1.0 flying a B-Wing, T-65 X-Wing & ARC-170. While it may sounds like a bad thing, I’m going to discuss why we should be celebrating like Ewoks after the 2nd Death Star popped like a red balloon. Whether you are huge lifelong Star Wars fan like myself, came of age to prequels (I’m sorry), or are just now jumping on the Disney run bandwagon now, some of the most memorable things are the spaceships & space battles in that galaxy far far away. That was THE reason why 3 years ago this month, I picked up X-Wing Miniatures Game 1.0 by Fantasy Flight Games (FFG). It had all the ships and big character names I knew & love, plus even the some of the ones from the old Legends period.Luke, Vader, Han, Chewie, Boba Fett, Millennium Falcon, TIE Fighters, Y-Wings, and of course X-Wings – all ready to go out of box with beautifully painted & sculpted models to start reenacting the famous dog fights scenes and to make new ones. Finally roll some dice to blow them out of the sky! You really couldn’t ask for a more elegant game to collect & play if you were Star Wars fan. Maneuvering your ships via dials – feeling like your piloting decisions matter. Simple game mechanics that are clean & easy to follow without a 40+ page FAQ/errata. That is why I’m super excited to see FFG releasing X-Wing 2nd Edition being released Sept 13th, 2018. The designers took all the things they learned from 1st edition and have improved upon it all. One of the more fun and more interesting aspects about X-Wing are the ship’s maneuvering dials. Deciding where your ship will go vs. where the enemy ships will be is what makes X-Wing so interesting to play. X-Wing 2.0 has re-done almost all the ship dials in the game. The result is that all the ships have a more unique flying profile e.g. 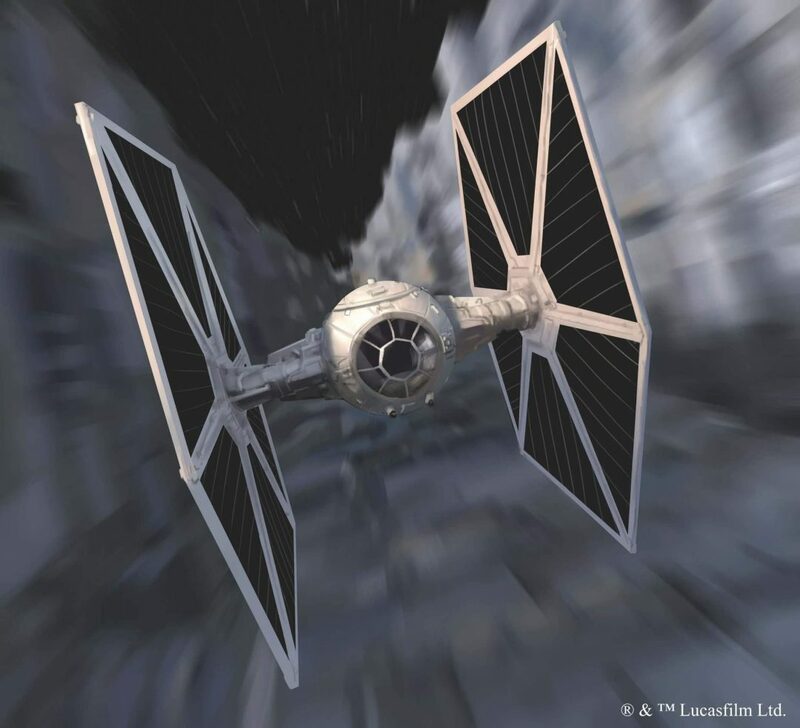 the lightweight TIE Interceptors fast & agile while B-Wings are slower with shorter & have harder maneuvers. This dial changes will also allow many of the original ships to catch up on some of new maneuvers that came along later in X-Wing 1.0 like like sloops, reverse, and talon rolls. In addition, FFG changed the green maneuvers to blue which helps those with color blindness. One of major changes in 2nd Edition is the removal of 360 degree turret. Instead of flying on an easy mode, pilots now have to think about where their guns are pointed at all times if they want to get a shot. This again increases the importance of piloting & those dials in order to keep your gun arcs on target. This small but important change helps keep the game more interesting and allows for more variety of ships on the board which we haven’t seen a lot at the end of 1st edition. A lot of us seasoned veterans are going to be flying like rookies as we have to unlearn what they have learned. One of the key things about learning X-Wing is it has always been easy to grasp the basic principles of the game. But at the end of 1st Edition, it wasn’t uncommon to have 8 upgrade cards on one ship. That was 8 different things each round to remember while playing over the course of a game. It made for some not-so-fun long conversations of how things interact and really dragged games out. In 2nd edition, we get back to the simple roots with fewer upgrades and more reliance on inherent ship abilities. With the release of X-Wing 2nd edition, all the game mechanic changes it is now even easier to get into the game. You can focus easily on a single faction – Rebels, Imperials, or Scum with Resistance, First Order, Republic, & Separatist to come. In X-wing 2nd Edition, there is no chasing cards in packs you don’t want. You don’t have to buy all the packages just to be able to field a viable squad. Simply buy a core set, pick your favorite faction ships, then you are good to go! On Sept. 13th, X-Wing 2nd Edition will be released and whether you are returning veteran or a rookie, we will all be on equal footing as we re-learn and experience the game again for first time. Many of us will find out how bad we are at this game and will have to learn how things again – which is half the fun. So come on by on Tuesday Night in McPherson or Thursday Night in Manhattan, ask for a demo game, or check out some games & join the fun. May the Force be with you & hope to see you at the table!